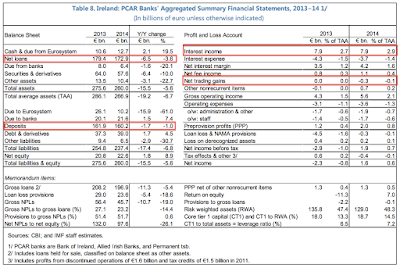 "Bank health continues to improve, but impaired assets remain high and profitability low. The contraction in the three domestic banks’ interest earning assets continued, albeit at a slower pace in 2014." IN other words, deleveraging is ongoing. "Nonetheless, operating profitability doubled to 0.8 percent of assets on foot of lower funding costs as well as nonrecurrent gains from asset sales and revaluations (Table 8). Led by the CRE and SME loan books, there was a sizable fall in the stock of nonperforming loans (NPL), by some 19 percent in 2014, although NPLs are still 23 percent of loans." Note, at 23% we are still the second worst performing banking system in the euro area, after Greece. "This fall, together with rising property prices, allowed significant provision releases while keeping the coverage ratio stable. 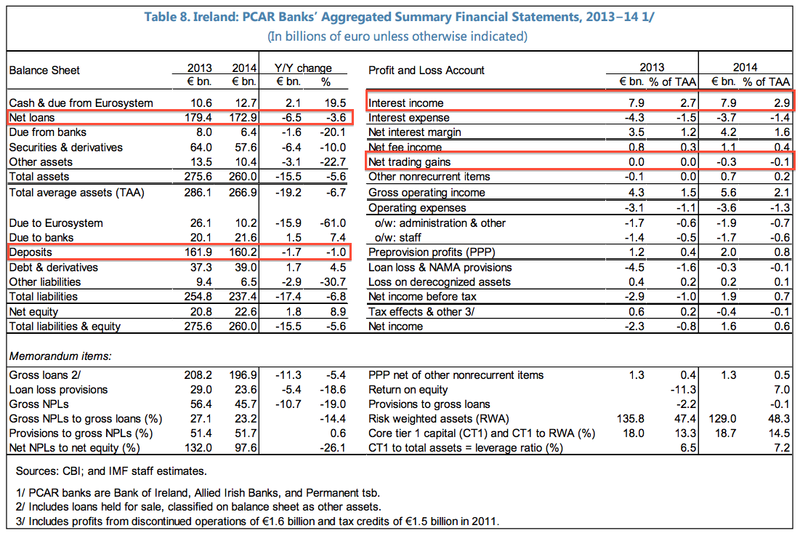 Profitability after provisions was achieved for the first time since the onset of the crisis. Together with lower risk weighted assets, this lifted the three banks’ aggregate core tier 1 capital ratio by over 1 percentage point, to 14½ percent." Now, take a look at the chart above: loans volume fell EUR6.5bn y/y (-3.6%), but interest income remained intact at EUR7.9bn. While funding costs fell EUR3.7bn y/y. The result is that the banks squeezed more out of fewer loans both on the margin and in total. Give it a thought: loans should be getting cheaper, but instead banks are getting 'healthier'. At the expense of who? Why, the remaining borrowers. Net trading profits now turned losses in 2014 compared to 2013. Offset by one-off profits. Deposits also fell in 2014 compared to 2013 as economy set into a 'robust recovery'. It looks like all the jobs creation going around ain't helping savings. Notice, in addition to the above discussion, the Texas Ratio: Non-Performing Loans ratio to Provisions + CT1 capital (higher ratio, higher risk in the system). At 108, things are better now than in 2012-2013, but on average, 2011-2012 Texas ratio was around 104, better than 2014 ratio. And that with 51.7% coverage ratio and with CT1 at 14.5%. Ugh?.. On the other hand, deleveraging helped so far: loan/deposit ratio is now at 108% a major improvement on the past. Net Stable Funding Ratio (NSFR) - a ratio of longer term funding to longer term liabilities and should be >100% in theory. This is now at 110.5%, first time above 100% - a good sign, reflective of much improved funding conditions for all euro area banks as well as Irish banks' gains. Liquidity Coverage Ratio (LCR) - monitoring the extent to which banks hold the necessary assets to cover any short-term liquidity shocks (basically, how much in highly liquid assets banks hold) is also rising and is above 100% - another positive for the banks. 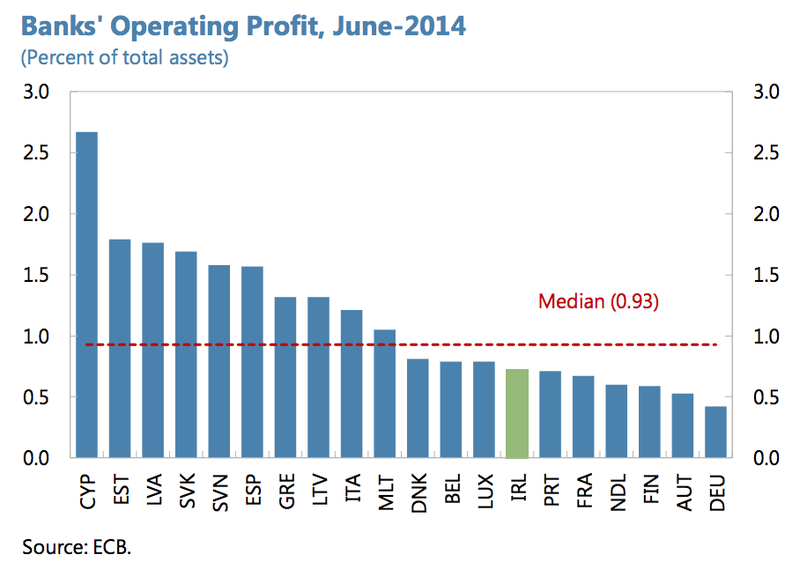 operating profitability remains relatively low. Declines in funding costs aided by QE will assist, but there are also drags from the prevalence of tracker mortgages in loan portfolios and from prospects for a prolonged period of low ECB rates. However, with rates on new floating rate mortgages at 4.1 percent at end March, compared with an average of 2.1 percent in the euro area, political pressures to reduce mortgage rates have emerged. The mission stressed the importance of loan pricing adequate to cover credit losses—including the high costs of collateral realization in Ireland—and to build capital needed to transition to fully loaded Basel III requirements in order to avoid impediments to a revival of lending." 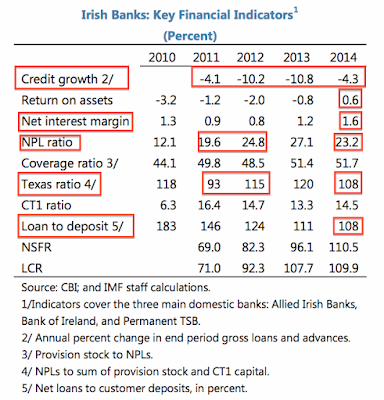 Here's a question IMF might want to ask: if Irish banks are already charging almost double the rates charged by other banks, while enjoying lower costs of funding and falling impairments, then why is Irish banks profitability a concern? And more pertinently, how is hiking effective rates charged in this economy going to help the banks with legacy loans, especially those that are currently marginally performing and only need a slight nudge to slip into arrears? And another question, if Irish banks charge double the rates of other banks, what is holding these other banks coming into the Irish market? Finally, how on earth charging even higher rates will support 'revival of lending'? Ah, yes, question, questions… not many answers. 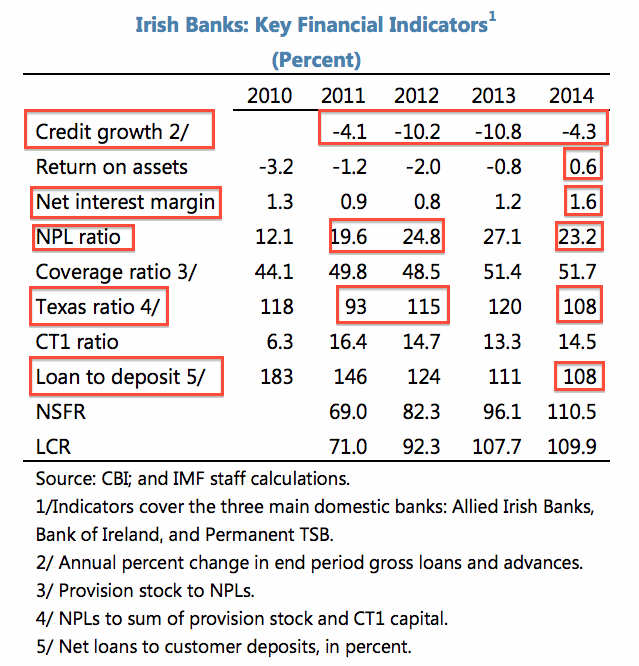 But, per IMF, everything is happy in the banking sector in Ireland. Just a bit more blood-letting from the borrowers (distressed - via arrears resolutions tightening, performing - via higher interest charges) and there will be a boom. One wonders - a boom in what, exactly? Insolvencies?